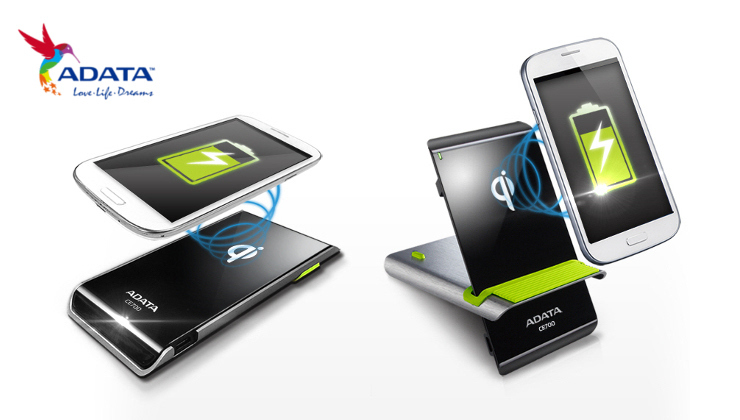 Taipei, Taiwan – January 23, 2014 - ADATA™ Technology, a leading manufacturer of high-performance DRAM modules and NAND Flash storage products, today announces the launch of the Elite Series CE700 wireless charging stand. The Elite CE700 presents a convenient way to charge compatible mobile phones through inductive charging, eliminating the need for cables and bulky transformers. By simply placing the phone on the charging pad that doubles as an adjustable phone stand, power is automatically and wirelessly transferred to the device. Housed in an elegant folding stand with a stylish aluminum back cover, the CE700 features a texturized rubber base that prevents the phone from slipping. The flexible design allows for use with a variety of mobile phones that support inductive charging, with wireless charging possible in both flat and upright modes. The unique bracket design allows users to adjust the angle of the charging pad in accordance with individual needs, and the CE700 can also be placed on a table with the phone upright, becoming an easy-to-use phone stand for better phone access and visibility. To minimize wasted electricity, the CE700 will automatically enter power-saving mode when not in use. The CE700 has been professionally certified to meet the Qi wireless charging standard, ensuring maximum compatibility and safety. FOD (Foreign Object Detection) capability and display protects users and ensures stable operation. Without the need for electrical contact points, the risk of electric shock is eliminated. Furthermore, inductive charging reduces mechanical wear from repeatedly connecting a cell phone to power cables. The ADATA Elite CE700 will be available through selected retailers and distributors for the MSRP of £31.50.